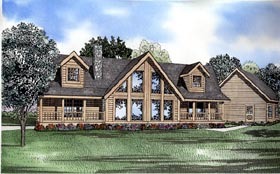 The full window view adds elegance to this log home plan with Covered Porches in the front and back. The Living room with fireplace has a soaring vaulted ceiling. The Master suite includes a walk-in closet, Private Bath and access to the Covered Porch. To the right of the Living room is the Dining room that opens to the Kitchen with eat-at bar and access to the Laundry room and Breezeway to Garage. The rear Foyer accessed from a Covered Porch has ample closet space. The upper floor contains a Loft and full bath between two Bedrooms with ample closet space and access to the Attic. There is also an Optional Bonus room above Garage.